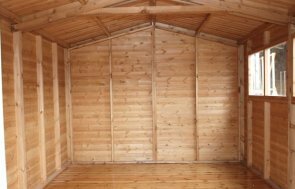 This 1.8 x 2.4m Superior Shed has been installed in the corner of our customer’s garden in Cropwell Butler, Nottinghamshire to be used as a small, but attractive garden storage shed. The apex roof has got cedar shingle tiles on that will silver down over the course of around six months to end up around the same colour as the roof of the customer’s barn. There are double doors with Georgian windows in the front side, and a set of two Georgian windows on the right gable end to add a traditional look to the shed. achieves a more natural look and feel to the shed. 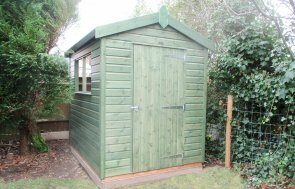 On the inside, this Superior is a basic shed because of its purpose, which is all the customer needs. 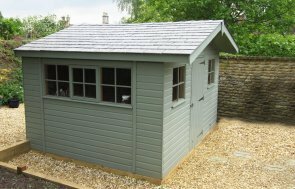 If you would like a Garden Shed, whether it is large or small, for storage or for use as a workshop, our wide range of sheds and style features can cater for your needs. For more information you can call us on 01760 444229 or send us an online enquiry and we’ll be able to help you.